First know that 95% of what goes on in a successful business is promotion, 5% product development. and present them in a way that makes them buy, you’ll never make much in sales. So Your Prospects Buy Them… NOW! This isn’t just a book. every time you use it for the rest of your life. 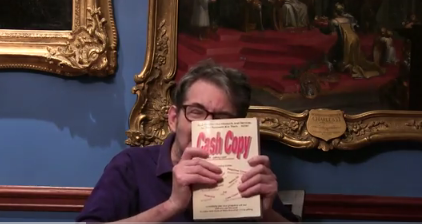 The reason “Cash Copy” is such an important book, and why it has, to date, grossed over $1,000,000 in sales, is because the overwhelming majority of people understand that you can’t make money working for someone else. You must have your own company with your own products and your own services. Having gathered them, you must master cash copywriting. It is not a luxury… it is an absolute necessity. And if you fail to master “Cash Copy”, your enterprise will fail and it will be your own fault. 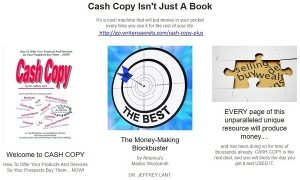 One book — “Cash Copy” — is the solution. Get it now, use it forever, and make over $1,000,000… predictably, certainly, and with careful steps that are already proven, not costly guesses. In short, “Cash Copy” works! Get Your Cash Copy TODAY! things, you’re just whistling “Dixie”. value this customer and desire his business. 2) Hand the customer a bonus coupon. and deliver with a smile! Then carry her purchase to her car! for that reason never offer it. bonus offer e-mailed at once! offers before you need them! is not just a motto for Boy Scouts. expiration date: like 5 days from e-mailing. Has made his Millions, multiple times. Author’s program note. Because today, August 1, 2011, is such a happy day, I wanted something suitably grand and festive to accompany this article; the kind of music that makes you want to jump up, throw up the sash on your window and, at the top of your voice, shout “Huzzah!”, because you want the rest of the too weary and downtrodden world to be as excited as you are. I’ve found that music. It’s a royal German military march called “Hohenfriedberger marsch”, and you’ll find it in any search engine. Go get it now and let one of the most soaring of marches lift your spirits and put you in the right frame of mind to develop your own online empire into a place where such grandeur is an everyday event… and where you do so well your generosity of heart, mind and spirit match mine on this anniversary day. Over the last 17 years online, I have talked to literally thousands of people who have begged, wheedled and pleaded with me to reveal the “secret” of Internet success. It is now my pleasure to tell you, tell all, withholding nothing. People who succeed online make a fetish of helping people. They know that if you give enough people what they want… you will surely and most assuredly get what you want. This sounds easy enough, doesn’t it? A piece of cake. However, you must never underestimate the powerful pull of human ego, selfishness, and self- destructive avarice. In short, humans find it difficult to focus on others, rather than themselves. Yet it is and will always be these others who control your ability to get rich online. I tell my marketing students “Your money is in their pockets,” the “their” being your customers. The only way to get it out is by completely changing your focus from yourself to…. them. Cautionary note: Like everyone reading this article, you will pledge your online operations to complete customer centeredness… and for a day or two you will be an empathetic paragon. Then imperceptibly you will slide back into the inveterate selfishness that condemns so many Internet entrepreneurs to humiliating, unnecessary failure. Remember: humans are born selfish, but it is only the customer-centered who succeed. Post this message so that you never forget, for to the extent you do is the extent to which you’ll undercut and block your own success. 2) Make it easy for your customers to connect with you. We live in an age of true communication marvels with a myriad of ways to connect, connect fast, connect now. The problem is, we don’t use them properly, rather infuriating customers by misusing these tools, or, worse, not using them at all… so that the age of instant contact becomes instead the age of thwarted contact. Are you one of the culprits? First, review each and every means you have for people connecting with you, including email, telephone, fax, etc., etc. Then review them as if you were the customer. Look at how you use them. When you use them. Even whether you use them. Are you a customer enabler… or are you a customer frustrater and avoider? You’ll SAY that you are doing everything humanly possible to expedite and improve customer contact and communication. But in all likelihood you’re not. The only way you’re going to know is by acting like a customer, ascertaining just how easy (or difficult) you’ve made things. You’re likely to be amazed at the maze and obstacles you’ve erected to frustrate customer relations. As soon as you know, re-arrange things so that you don’t just THINK you are customer-centered, but actually are. 3) Make an offer… then make a better offer. To make money, give things away. To make more money, give more things away. The richest people online are those who give the most away. They spend their days not just creating and discovering useful new products and services. That’s necessary and essential for success… but it isn’t the key variable. That key variable is the extras, the special offer you’re going to give customers for acting NOW! In other words, the all-important offer. Now hear this: OFFERS are what get people to buy now… thus, the better the offer, the faster the sale. It’s as simple as that. So, let’s see what you’re doing now and whether the offers you’re making will take you to the financial destiny you desire. First, are you making any offers at all? You’d be surprised at how many entrepreneurs have a “take it or leave it” attitude about what they’re selling… punctuated with this killer proposition: “what I’m selling is so good, it sells itself.” This is one of the most foolish of propositions. Nothing, absolutely nothing, sells itself. But if you don’t have a special enticing, motivating offer with what you’re selling then you’ve cooked your own goose. Immediate re-thinking is necessary. If you’re making some kind of offer, good for you. At least, you’ve got you r foot on the right road. Now let’s see whether you’ve got what it takes to move ahead. Review your offer in the light of what your competitors are doing, easy enough on the Web. If what you’re offering to induce immediate sale is only as good as (or less than) what your competitors are offering… then you’ve got a serious problem… and you need some serious action at once. The offer you make, the offer that delivers the sales and the cash, must be demonstrably better than anything offered by anyone… and the customer must be able to see this at a glance…. 4) Create a customer-centered blog and use it daily. Over the last 17 years online there has been one astonishing development after another. One of the most important is the creation and development of blogging; it’s a device that every successful Internet entrepreneur understands and uses daily, the better to achieve more substantial success. You will succeed online only to the extent you understand blogging and blog daily. Let’s start by helping you understand why it’s so important. A blog gives you the opportunity to send out advertisements daily, without risking your list as people do who email ads and nothing but ads. Your blog is anchored by useful articles and information. These client-centered articles and information protect the integrity of your list. So long as your ads are accompanied by this useful content, you can email your list regularly. Sending ads alone cannot achieve the desired objective; instead you’ll list will dwindle into insignificance. 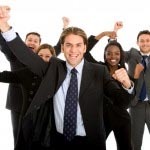 Successful online entrepreneurs know they’ve participating in the greatest game of our time, a game that delivers customers and customer sales 24 hours a day and can turn even the smallest home business into an unstoppable cash cow. And isn’t that just what you want? Don’t wait another minute to get started. Put a smile on your face and set about the task before you, making liberal reference to these recommendations. It’s the way to ensue 17 years of success online, as I’ve had, with many more successful years after that. Where NOTHING else is ever allowed, tolerated, or accepted. Now take a dollar bill and staple it to a piece of paper. Then post it where you can see it every day. That dollar, that single dollar, is the single step that begins the thousand mile journey to wealth. It is now time to “psych yourself up”, to put your brain in the proper state and condition so it can do its essential work. When you are ready… promote./ When you are not… promote. When it rains… promote/ when it’s dry… promote. When you’re rich… promote./ when you’re not … promote. When you feel like it… promote./ When you don’t… promote! The great thing about a mantra is that is can easily be customized for you. “When my kids are screaming… promote/ When they’re not… promote!” Get it? Mantras are designed to put yourself in the place you need to be, your subconscious mind ready to take you there. If your goal is wealth, and if not why not, now’s the moment to play the numbers game. The number of sales and dollars therefrom. 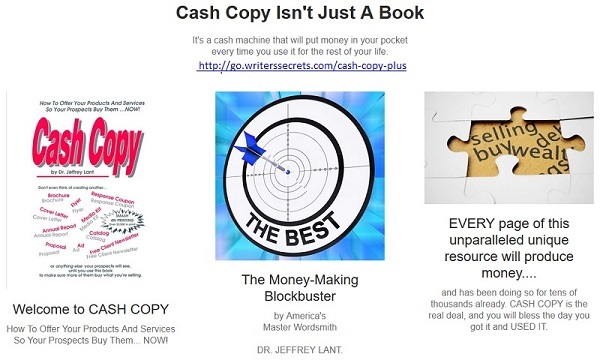 Another essential tool is Cash Copy – The Copy-writer’s bible.